ItemBARK_1990.0003.0674 - Chow Dong Hoy (right) and unidentified man; circa 1910. 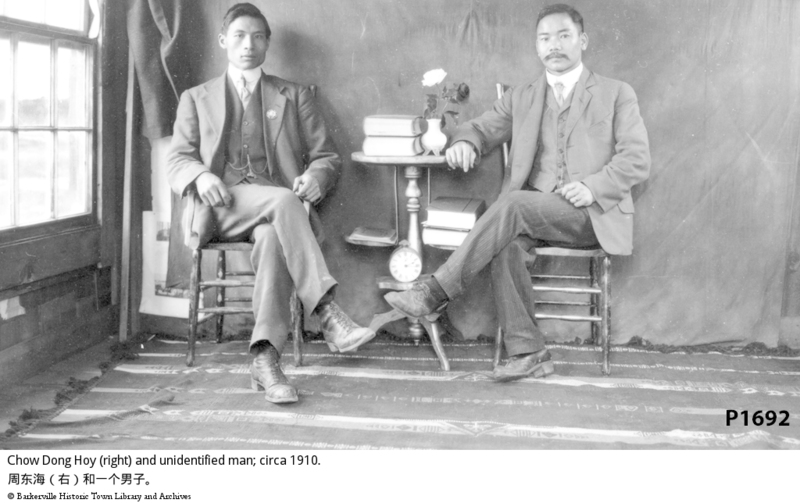 Item BARK_1990.0003.0674 - Chow Dong Hoy (right) and unidentified man; circa 1910. Chow Dong Hoy (right) and unidentified man; circa 1910. Two Chinese men sitting in front of a dark cloth backdrop. The small table between them has some books, a vase with flowers and an alarm clock on it. There is a window to the left and a rug on the floor. The unidentified man in the photo is probably Chow's cousin.